Consistent with the US National Security Strategy, energy and environmental security are not just problems for America, they are critical challenges for the entire world. Expanding human populations and declining natural resources are potential sources of local and strategic conflict in the 21st Century, and many see energy scarcity as the foremost threat to national security. Conflict prevention is of particular interest to security-providing institutions such as the U.S. Department of Defense which has elevated energy and environmental security as priority issues with a mandate to proactively find and create solutions that ensure U.S. and partner strategic security is preserved. The magnitude of the looming energy and environmental problems is significant enough to warrant consideration of all options, to include revisiting a concept called Space Based Solar Power (SBSP) first invented in the United States almost 40 years ago. The basic idea is very straightforward: place very large solar arrays into continuously and intensely sunlit Earth orbit (1,366 watts/m2), collect gigawatts of electrical energy, electromagnetically beam it to Earth, and receive it on the surface for use either as baseload power via direct connection to the existing electrical grid, conversion into manufactured synthetic hydrocarbon fuels, or as low-intensity broadcast power beamed directly to consumers. A single kilometer-wide band of geosynchronous earth orbit experiences enough solar flux in one year to nearly equal the amount of energy contained within all known recoverable conventional oil reserves on Earth today. This amount of energy indicates that there is enormous potential for energy security, economic development, improved environmental stewardship, advancement of general space faring, and overall national security for those nations who construct and possess a SBSP capability. NASA and DOE have collectively spent $80M over the last three decades in sporadic efforts studying this concept (by comparison, the U.S. Government has spent approximately $21B over the last 50 years continuously pursuing nuclear fusion). The first major effort occurred in the 1970’s where scientific feasibility of the concept was established and a reference 5 GW design was proposed. Unfortunately 1970’s architecture and technology levels could not support an economic case for development relative to other lower-cost energy alternatives on the market. In 1995-1997 NASA initiated a “Fresh Look” Study to re-examine the concept relative to modern technological capabilities. The report (validated by the National Research Council) indicated that technology vectors to satisfy SBSP development were converging quickly and provided recommended development focus areas, but for various reasons that again included the relatively lower cost of other energies, policy makers elected not to pursue a development effort. The post-9/11 situation has changed that calculus considerably. Oil prices have jumped from $15/barrel to now $80/barrel in less than a decade. In addition to the emergence of global concerns over climate change, American and allied energy source security is now under threat from actors that seek to destabilize or control global energy markets as well as increased energy demand competition by emerging global economies. Our National Security Strategy recognizes that many nations are too dependent on foreign oil, often imported from unstable portions of the world, and seeks to remedy the problem by accelerating the deployment of clean technologies to enhance energy security, reduce poverty, and reduce pollution in a way that will ignite an era of global growth through free markets and free trade. Senior U.S. leaders need solutions with strategic impact that can be delivered in a relevant period of time. 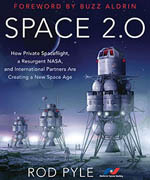 In March of 2007, the National Security Space Office (NSSO) Advanced Concepts Office (“Dreamworks”) presented this idea to the agency director. Recognizing the potential for this concept to influence not only energy, but also space, economic, environmental, and national security, the Director instructed the Advanced Concepts Office to quickly collect as much information as possible on the feasibility of this concept. Without the time or funds to contract for a traditional architecture study, Dreamworks turned to an innovative solution: the creation on April 21, 2007, of an open source, internet-based, interactive collaboration forum aimed at gathering the world’s SBSP experts into one particular cyberspace. Discussion grew immediately and exponentially, such that there are now 170 active contributors as of the release of this report—this study approach was an unequivocal success and should serve as a model for DoD when considering other study topics. Study leaders organized discussions into five groups: 1) a common plenary session, 2) science & technology, 3) law & policy, 4) infrastructure and logistics, and 5) the business case, and challenged the group to answer one fundamental question: Can the United States and partners enable the development and deployment of a space-based solar power system within the first half of the 21st Century such that if constructed could provide affordable, clean, safe, reliable, sustainable, and expandable energy for its consumers? Discussion results were summarized and presented at a two-day conference in Colorado on 6-7 September graciously hosted by the U.S. Air Force Academy Eisenhower Center for Space and Defense Studies. 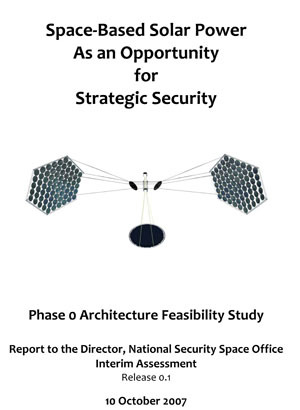 The SBSP Study Group concluded that space-based solar power does present a strategic opportunity that could significantly advance US and partner security, capability, and freedom of action and merits significant further attention on the part of both the US Government and the private sector. The SBSP Study Group concluded that while significant technical challenges remain, Space-Based Solar Power is more technically executable than ever before and current technological vectors promise to further improve its viability. A government-led proof-of-concept demonstration could serve to catalyze commercial sector development. The SBSP Study Group concluded that SBSP requires a coordinated national program with high-level leadership and resourcing commensurate with its promise, but at least on the level of fusion energy research or International Space Station construction and operations. The SBSP Study Group concluded that should the U.S. begin a coordinated national program to develop SBSP, it should expect to find that broad interest in SBSP exists outside of the US Government, ranging from aerospace and energy industries; to foreign governments such as Japan, the EU, Canada, India, China, Russia, and others; to many individual citizens who are increasingly concerned about the preservation of energy security and environmental quality. While the best chances for development are likely to occur with US Government support, it is entirely possible that SBSP development may be independently pursued elsewhere without U.S. leadership. Several major challenges will need to be overcome to make SBSP a reality, including the creation of low-cost space access and a supporting infrastructure system on Earth and in space. Solving these space access and operations challenges for SBSP will in turn also open space for a host of other activities that include space tourism, manufacturing, lunar or asteroid resource utilization, and eventually settlement to extend the human race. 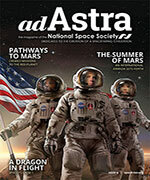 Because DoD would not want to own SBSP satellites, but rather just purchase the delivered energy as it currently does via traditional terrestrial utilities, a repeated review finding is that the commercial sector will need Government to accomplish three major tasks to catalyze SBSP development. The first is to retire a major portion of the early technical risks. This can be accomplished via an incremental research and development program that culminates with a space-borne proof-of-concept demonstration in the next decade. A spiral development proposal to field a 10 MW continuous pilot plant en route to gigawatts-class systems is included in Appendix B. The second challenge is to facilitate the policy, regulatory, legal, and organizational instruments that will be necessary to create the partnerships and relationships (commercial-commercial, government-commercial, and government-government) needed for this concept to succeed. The final Government contribution is to become a direct early adopter and to incentivize other early adopters much as is accomplished on a regular basis with other renewable energy systems coming on-line today. For the DoD specifically, beamed energy from space in quantities greater than 5 MWe has the potential to be a disruptive game changer on the battlefield. SBSP and its enabling wireless power transmission technology could facilitate extremely flexible “energy on demand” for combat units and installations across an entire theater, while significantly reducing dependence on vulnerable over-land fuel deliveries. SBSP could also enable entirely new force structures and capabilities such as ultra long-endurance airborne or terrestrial surveillance or combat systems to include the individual soldier himself. More routinely, SBSP could provide the ability to deliver rapid and sustainable humanitarian energy to a disaster area or to a local population undergoing nation-building activities. SBSP could also facilitate base “islanding” such that each installation has the ability to operate independent of vulnerable ground-based energy delivery infrastructures. In addition to helping American and allied defense establishments remain relevant over the entire 21st Century through more secure supply lines, perhaps the greatest military benefit of SBSP is to lessen the chances of conflict due to energy scarcity by providing access to a strategically secure energy supply. Despite this early interim review success, there are still many more questions that must be answered before a full-scale commercial development decision can be made. It is proposed that in the spirit of the original collaborative SBSP Study Group charter, that this interim report becomes a living document to collect, summarize, and recommend on the evolution of SBSP. The positive indicators observed to surround SBSP by this review team suggest that it would be in the US Government’s and the nation’s interest to sponsor an immediate proof-of-concept demonstration project and a formally funded, follow-on architecture study conducted in full collaboration with industry and willing international partners. The purpose of a follow-on study will be to definitively rather than speculatively answer the question of whether all of the barriers to SBSP development can be retired within the next four decades and to create an actionable business case and construction effort roadmap that will lead to the installation of utility-grade SBSP electric power plants. Considering the development timescales that are involved, and the exponential growth of population and resource pressures within that same strategic period, it is imperative that this work for “drilling up” vs. drilling down for energy security begins immediately.